In some parts of the world, softshell turtles are eaten as a delicacy. Their meat is often used as the main ingredient for a tasty soup. In the wild, on the other hand, they are known as aggressive foragers. Meanwhile, at home and as pets, they are quite demanding when it comes to care and maintenance. That being said, this is not exactly the best choice for a pet if you are just a beginner. One thing that makes it unique when compared to other turtle species is the absence of a hard and brittle shell or carapace. The shell is flat, and it has no scales or epidermal chutes. They have a streamlined head and a long neck. These turtles also have elongated snouts. There are different subspecies of this turtle, each demonstrating a different appearance, although in general, they are the same. The spiny soft-shelled turtles, for instance, have spiny protrusions outside of the shell. The smooth softshell turtle, on the other hand, has no protrusions. Their carapace is shiny and they usually have big patterns. Meanwhile, Florida softshell turtles are known for being large. As it has been mentioned in the introduction, softshell turtles are known for being foragers. They can also be aggressive. They usually exhibit a ferocious behavior when they feel that they are going to be disturbed by predators. Unlike others, softshell turtles are not also cuddly. With this, you might want to avoid it as a pet when there are children at home. To succeed in taking care of a softshell turtle as a pet, you need to create an aquatic habitat that can effectively mimic where it lives in the wild. When choosing an enclosure to serve as the housing of the turtle, the first thing that you have to do is to determine its size. The Florida softshell turtle can grow over two feet and the weight can reach up to 40 pounds, which means that if it is the breed that you plan to have as a pet, you need to choose a large aquarium. The quality of the water in the tank is important to create a healthy environment for the softshell turtle. Invest in canister and submersible filters to make sure that the water will be free of impurities that can harm your pet. Fungal and bacterial infections will also be common if the water is not kept clean. In terms of the heat requirements, they will be at their best when the temperature is more than 70 degrees Fahrenheit. To eliminaate guesswork, the Zoo Med Labs Digital Thermometer. will be a great product to have, which can also be used in measuring the humidity in the tank. The right substrate material will also be essential. 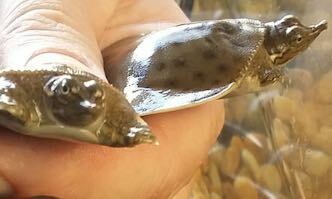 For this breed, soft sand is the best to put at the bottom, which will be the same as what the softshell turtle will find in their native habitats. You should avoid using gravel as the substrate. They are rough and can be abrasive on the fragile body of the softshell turtles. Heat and UVB lights will also be essential components of their enclosures. The UVB rays are important to allow reptiles like turtles to make use of the calcium in their diet. Especially when they are kept indoors, you need to provide light for about 10 to 12 hours. For easy installation of the light bulb, use the Zoo Med Reptile Lamp Stand. , which can also offer easy adjustments based on how near or far you need the light to be. Similar to most turtles, a softshell will also need a basking spot. Aside from the installation of a basking lamp, you also need to have a platform where it can rest when it needs a break from the water. With this, one of the best products that you can have is the Fluker’s Castle Crib Reptile Basking Platform. Softshell turtles will prefer eating on water than on land. In the wild, their diet consists mostly of insects, eggs, amphibians, and fish. When they are captive, on the other hand, they are adaptable to their environment. They can eat turtle pellets. However, to provide these turtles with a balanced meal, it will also be a good thing if they will be given mealworms and crickets, among others. To keep their foods fresh, consider investing in an airtight container, such as Gamma Seal 5-gallon Bucket Storage with Sealed Lid.. It will also be good to provide a supplement that will give them the vitamins and minerals that they need. In this case, the Herptivite Multivitamins. can be a great choice. This is a powder that can be added to the regular food of turtles. The soft carapace of the softshell turtle can be a problem. In the wild, they are known as a common target amongst alligators. Even at home, they are at risk, especially if you have dogs around. Their shell can be easily prone to injury, so you should always keep an eye. It is important to frequently check the physical appearance of the turtle, especially the carapace. If it is crusty or if it appears that it suffered from an injury, this is a sign of a problem. Get in touch with a veterinarian as soon as possible before the problem becomes worse. Some of the most common signs that will be indicative of an illness include swollen eyes, loss of appetite, runny nose, wheezing, discoloration of the shell, and unresponsiveness. Avoid holding a softshell turtle, especially if it is not yet familiar with you. It might feel threatened and bite you in an instant. Although these turtles are generally timid, they hate it when they are handled. Because of their aggressiveness, it will also be best to keep a softshell turtle in isolation. Besides, it is usually large, so it will be great if it will be kept on its own in an enclosure. Regular clipping of the beak of the softshell turtle is also important, but this should be done only by an experienced veterinarian.